With their plans for a residential district on this former shipbuilding site, OMA were perpetuating the tradition of the garden cities nearby and militating against an attitude then prevalent in the Netherlands to urban design in which a ‘low-rise jungle’ approach was to inject a feeling of humanity into housing estates. 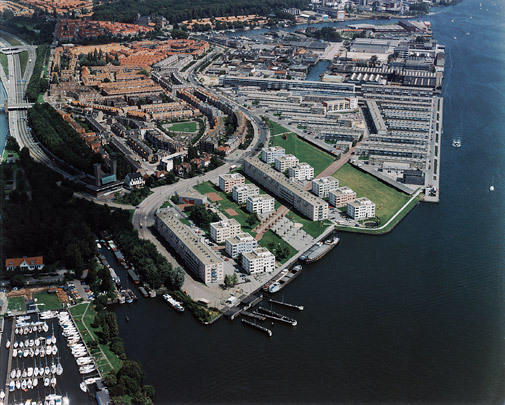 IJ-plein consists of two neighbourhoods, an urban part in the west and a village part in the east. In the former, elongated housing blocks alternate with ‘urban villas’, apartment blocks scaled to free-standing town houses such as those lining the outermost concentric canal ring in Amsterdam. The triangular eastern part comprises low-rise rows interspersed with narrow streets and communal gardens. Separating the two parts is a strip of park. A red asphalt path links a triangular square in the east with a ferry service from the western extremity to the city centre. OMA have taken great pains in the arrangement of elements on site, deploying indigenous tree types and characteristically Dutch landscaping such as drainage ditches and allotment gardens, plus sports and circuit training facilities. Besides the siting and general shaping of the housing blocks, which were then elaborated on by different architects, OMA also stipulated beforehand the colour of the facades. Seven architectural offices were involved in fleshing out the projects. OMA's own contributions are the easternmost block, an elongated apartment building on stilts with its ground plane packing services into two triangular volumes, and a smaller parallel block.